- UK economy to grow by 0.3% in Q1 says Pantheon Macroeconomics. - Surveys overstate slowdown, as retail and industrial sectors recover. - Market still underestimating BoE say Pantheon and Capital Economics. 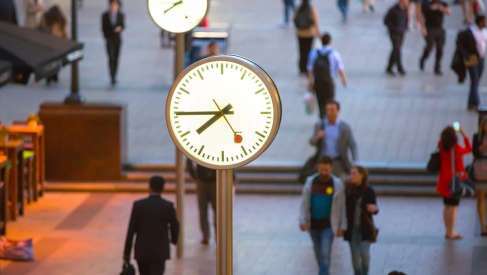 The UK economy has slowed in recent months but not by enough to see GDP stagnate in the first-quarter of 2019 according to economists at Pantheon Macroeconomics, who say recent business surveys have overstated the headwinds that are currently stunting growth. Pantheon says the economy will grow at a steady pace this quarter and flags that this, as well as mounting inflation pressures, could see the Bank of England (BoE) use Thursday's policy statement to warn that markets are underestimating how soon and how high it could lift interest rates. "If it weren't for Brexit disruption, the Committee likely would be seriously considering raising Bank Rate right now, given that the economy is about to be supported by fiscal stimulus and unit wage costs are growing at rates that suggest inflation will overshoot the 2% target modestly" says Samuel Tombs, chief UK economist at Pantheon. That call came as markets grapple with a series of business surveys released this week that point to trouble ahead for the economy. Activity in the key services sector fell in January to its lowest level since the Brexit referendum, while the manufacturing and construction industries also weakened. This in turn took the all-sector PMI down from 51.5 in December to 50.3 last month, its lowest point since August 2016, which is a level that is consistent with UK GDP growth of 0% for the first-quarter. Most firms cited uncertainty over the Brexit process for a more downbeat mood in January. Activity is falling at a time when the UK parliament remains divided over how best to exit the European Union and as the clock ticks down to a so-called no deal Brexit, which will happen on March 29 if Prime Minister Theresa May has not managed to get her Withdrawal Agreement ratified by then. "We are reluctant, however, to take the PMIs literally. They are rarely spot on" Tombs writes, in a note to clients. "It is well known that the PMIs were far too downbeat immediately after the referendum, suggesting that they tend to overstate the impact of political uncertainty on the economy." Above: Composite PMI alongside real GDP growth rate (Black). Source: Pantheon Macroeconomics. IHS Markit PMIs suggested immediately after the referendum that the UK services, construction and manufacturing industries were in recession, and they continued to point to a contraction through the rest of that quarter. However, Office for National Statistics (ONS) data subsequently revealed the economy grew by 0.5% during that quarter, down only a fraction from the 0.7% increase seen in the prior period. And that's not the only example of PMI surveys having gotten things wrong. "They also pointed to recessions after stockmarket downturns in 1998, 2001 and 2003. None of these recessions materialised," says Tombs. "We still expect GDP to increase on a quarter-on-quarter basis in Q1, though the risks to our 0.3% forecast now lie to the downside." IHS Markit surveys cover industries that account for 70% of GDP and they ignore the retail, non-manufacturing industrial and government services sectors completely. This means they are blind to large and important parts of the economy such as the High Street. And Tombs says there are grounds for thinking growth in retail spending and non-manufacturing industrial output actually picked up in January. Above: BRC retail sales growth alongside ONS measure (Black). Source: Pantheon Macroeconomics. Pantheon is forecasting GDP growth of 0.3% for the first quarter and 1.6% for 2019 overall. He also says this ongoing growth, combined with elevated inflation, will mean the Bank of England remains under pressure to raise its interest rate further during the months ahead. This is in keeping with the view of economists at Capital Economics, who said this week that uncertainty about the Brexit process is acting as a handbrake on the economy, but that growth could pick up sharply if they are right in forecasting the UK will make an orderly departure from the EU in March. Both Capital Economics and Pantheon are forecasting a total of four interest rate rises from the Bank of England before the end of 2020, which is substantially more policy tightening than the one solitary rate hike the market is currently pricing in for that period. Above: Financial market expectations for BoE interest rates. Source: Capital Economics. The Bank of England will announce its latest interest rate decision and economic forecasts at 12:00 Thursday and the recent PMI headlines mean there is a risk the Bank adopts a cautious tone in its communications this week. However, inflation remains above the 2% target and workers' wages are now growing at an even faster pace, which is a recipe for even higher inflation further down the line, or so argues conventional economic theory. The BoE projected in November that even after raising rates once per year until 2021 the consumer price index would still remain above its target at the end of the forecast period. Inflation has been above 2% since early 2017. This means further interest rate hikes are almost certain to come sooner or later. And those hikes could have a significant positive impact on Pound Sterling exchange rates, particularly if the likes of the Federal Reserve and European Central Bank are still sat on their hands when the BoE begins to move.